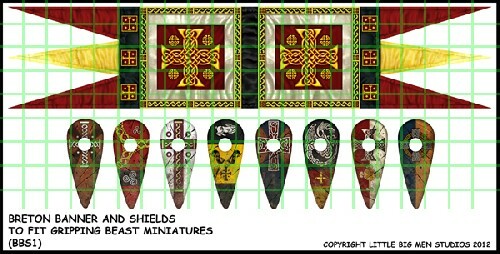 This is a banner and shield transfer sheet for Gripping Beast Breton figures for their Saga rules system. (can also be used with other nationalities and miniatures) The Bretons were of Celtic ancestry. Rather than just do the typical Norman style of tdesigns I tried to reflect a bit of a Celtic influence with the style of the crosses and adding knot-work and some Celtic spirals. Mixed with a Norman and Frankish influence as well, they give the Bretons a more distinct appearance to the thier Norman neighbours.